Our Blooming Flower Tea (also known as Artistic Tea, Display Tea, Crafted Tea, Hand-Crafted Tea) is made of the highest grade green tea and natural herb flowers. 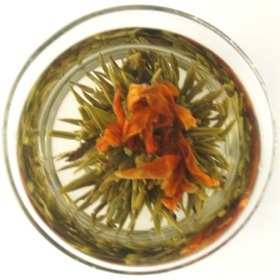 The Blooming Flower Tea will unfurl when added to water, revealing delicate flowers hidden within. The practice of hand-sewing leaves into blooming teas is an age-old Chinese art form that dates back centuries.